Chronic pain and depression often co-occur in the relationship between the two experiences can be hard to separate. One is located in the anterior cingulate cortex and seems to be involved in the emotional experience of pain, the experience of depression or anxiety associated with pain. One is located in the insula and relates to the purely sensory experience of pain. Damage to the dorsal anterior cingulate cortex eliminated the depression and anxiety component of pain and chronic stimulation of the anterior cingulate cortex seemed to result in the experience of depression and anxiety. By contrast, lesions of the posterior insula reduced the experience of the sensory component of pain. 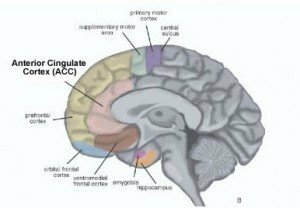 The anterior cingulate cortex is intimately involved in the experience of anxiety or fear as well as depression. It seems to be involved in the processing of information related to monitoring for unexpected and potentially dangerous events. According to Eisenberger and Lieberman (2004) the function of this brain region is to detect discrepancies, such as those between desired and actual conditions. It triggers an alarm or warning signal that disrupts attention to refocus us on the source of the threat. However, this same brain area (ACC) is also activated when we experience these other emotions that are prompted by things that are unexpected such as surprise. 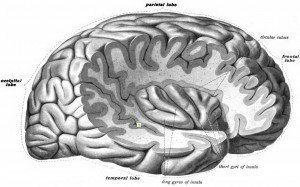 The insula or insular cortex is a phylogenetically old part of the cortex that is involved in processing homeostatic information such as pain, temperature, itch, local oxygen status, and sensual touch. showed that receiving a painful stimulus activates the entire central nervous system pain matrix, whereas watching a loved one receive the same stimulus leaves somatosensory areas—including the posterior insular cortex—quiet but robustly activates the dACC, with the amount of activation correlating with individuals’ self-reported empathy scores. The anterior cingulate cortex is thus involved in the experience of “feeling the pain” of a loved one. Barthas F, Sellmeijer J, Hugel S, Waltisperger E, Barrot M, Yalcin I (2015): The anterior cingulate cortex is a critical hub for pain-induced depression. Biol Psychiatry 77:236–245. Eisenberger, N. I. and M. D. Lieberman (2004). “Why rejection hurts: A common neural alarm system for physical and social pain. Trends in Cognitive Sciences.” Trends in Cognitive Sciences. 8: 294-300. Singer T, Seymour B, O’Doherty J, Kaube H, Dolan RJ, Frith CD (2004): Empathy for pain involves the affective but not sensory components of pain. Science 303:1157–1162.